You are currently browsing articles tagged pickle party. 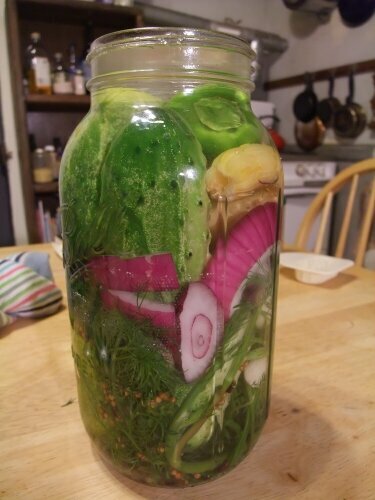 You can’t go wrong with gallons of live fermented cucumber dills and live music. Zoyres Eastern European Wild Ferment will deliver homemade kosher dills, half-sours, and new pickles plus funky, frenetic, horn-heavy Balkan and klezmer music to Viracocha on Valencia St. in San Francisco this Thursday, July 29. This is a band that joins fermented food and music and the price of admission is worth each of them alone. Find them on the youtube and watch at the video of them here. Then check out the show and be inspired to pickle some cucumbers of your own!